It’s LIQUID Group is pleased to announce MORPHOS – Sustainable Empires, an exhibition of architecture projects, photographic and video-architecture works, plans and scale models. The exhibition will be held in Venice in the months between June and November 2014, in the same period of Architecture Biennale. The first event of the festival will be at Palazzo Albrizzi (Cannaregio 4118, 30121 Venice, Italy), from the 06 to the 13 of June 2014 (press conference on June 05, 2014). The festival will be curated by Arch. Luca Curci (Founder of LUCA CURCI ARCHITECTS and It’s LIQUID Group) with a board of international architects, urban planners and designers. The events will be held in some exclusive locations in Venice, located at few meters from the Ponte di Rialto on the Canal Grande and between San Marco square and the Arsenale (more venues to be announced). 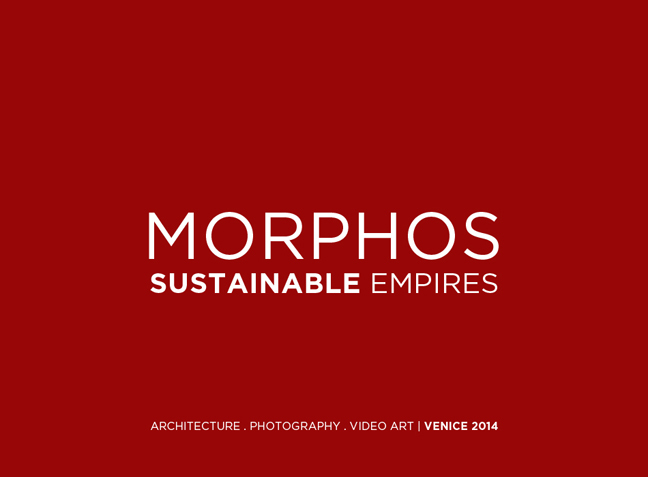 The main concept of “MORPHOS – Sustainable Empires” is the unifying power of sustainable architecture. We imagine a future in which sustainable thinking will be the common ground of every cultures’ architecture expressions, and the hybridization of social and cultural realities will represent the new frontier of our lives. Smart cities – Human beings are more and more concerned about their lives’ environmental impact. Our aim is to show architecture projects created with the idea of minimizing the required inputs of energy, water and pollution in order to meet individuals’ sensibility and encourage their own responsibility for protecting their environment. Connecting cultures – We dream about a world with no borders or distinctions, a culture melting pot where people can live, meet, learn, work, socialize and create new hybrid cultures. We think architecture could cover a leading role in this play, creating common places and structures that will aggregate crowds to win the alienation of contemporary cities. Possible futures – Contemporary architecture provides with representations of a hyper-fast changing world, through new experimentations and solutions which integrate with the environment. Architecture is no longer conceived as a container of human life, but as extensions of the body. Mixing sustainable transport, modern (ICT) communication infrastructures, sustainable economic development, and wise management of natural resources, human, intellectual and social capital, is the key to reach a future better life quality. We imagine a world of “liquid cities”, where differences create new compounds and exchange possibilities, instead of being social barriers. The whole city of Venice will be involved during the six months of the Architecture Biennale, hosting international investors, architects, designers, collateral art events, conferences and summits.